Sunil Chhetri (Nepali: सुनिल छेत्री; Hindi: सुनील छेत्री; born 3 August 1984) is an Indian professional footballer who plays as a striker for Bengaluru FC in the I-League on loan from Mumbai City in the Indian Super League. He is the captain of the Indian national football team, and also the all-time top goalscorer with 64 goals for the senior national team. 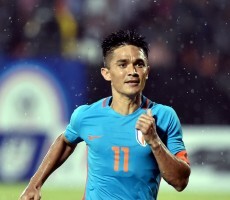 A colossus of Indian football, Sunil Chhetri is India’s all-time top scorer and the third highest in the list of active international scorers in world football. He recently helped India win the Hero Intercontinental Cup 2018, scoring in every match of the tournament, a feat he had managed in SAFF Cup 2011 as well. He thus became the first Indian to score in every game of two international tournaments. A Bengaluru FC player since their inception, he is definitely a captain, a leader and a legend. After the departure of John Johnson, he remains the only player to play for Bengaluru in all seasons of their existence. He scored 14 goals in 2017-18, the most by an Indian in a season of Hero ISL. For his magnificent performances, he walked away with the ‘Hero of the League’ award last season and was also adjudged the ‘AIFF Player of the Year’ for 2017.